Contact TEAM today to begin your search! 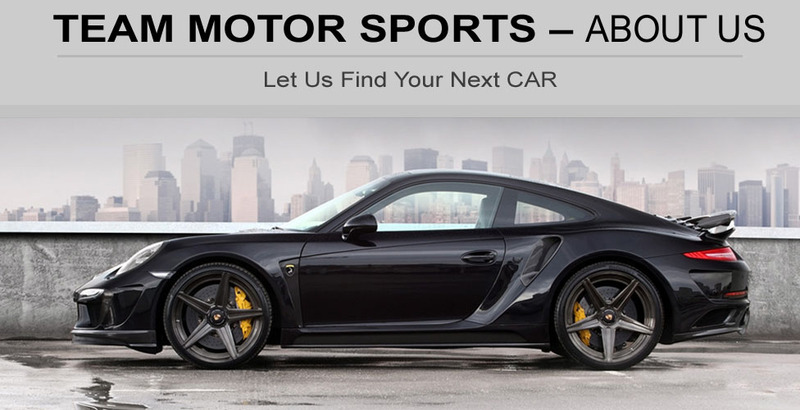 Since 1989, TEAM Motorsports of Missouri is dedicated to delivering the finest in exotic and luxury automobiles to you. WE'RE UPGRADING TO SERVE YOU BETTER! We have a vast inventory of hard to find exotics and top of the line luxury in our inventory. Our inventory is ever changing so if you do not find something that you are looking for here, feel free to contact us so that we may further assist you. Our inventory includes all makes and models, including both new and pre-owned. Some of our high-lines include: Corvette, Ferrari, Jaguar, Lexus, Mercedes, NSX, Porsche, Viper, and more. We also carry SUVs. Have an older luxury vehicle, or are you looking to trade in? We buy low mileage, high quality vehicles in excellent condition. Contact us today!